Many strong and valid arguments against the idea of human rights exist. Is it right, for example, to assume universality; that is, do all human beings in all societies require and/or desire the same rights? Are these universal rights predicated on Western values and norms, leading to discriminatory behaviour towards those who do not fit this Christian ideal of human nature (Walker 2015)? Furthermore, is it feasibly possible to legally enforce and protect the rights of individuals on a global scale without contradicting principles of national sovereignty (Fagen 2009)? These are indeed pressing issues worthy of consideration. However, this essay aims to present the argument that our contemporary notion of human rights is not fit for the 21st century. It is not an argument against the idea of a system of rights that morally and/or legally has the intention of protecting humanity, but rather, human rights as it exists in its present form needs to respond and adapt to the emerging needs of present and future generations. A truly effective and valuable system of rights should be capable of reflecting and adapting to increasingly fluid notions of how we understand ourselves, others and (post/trans) humanity in general. For example, blurring boundaries between human-animal-machine raises questions about the extension of rights beyond the human (Fuller 2014). Additionally, a recent Human Rights Watch report (2015) asks how humans can be protected against fully autonomous weapons (“killer robots”) when no one can be held personally accountable for any unlawful harm caused by these machines. Furthermore, emerging technologies are shifting conventional understandings of health, the body, identities and indeed, humanity in the 21st century. Transhumanist commentators argue that in order to fully reap the benefits as well as protect oneself against the potential coercive use of these technologies, we should be entitled to morphological freedom: that is, the right to modify or resist modification of the mind and body at one’s disposal (Sandberg 2013). This essay is split into two parts. The first part outlines the principles that underlie our contemporary understanding of human rights. It aims to lay a foundation for how such a concept of rights exists and how it could adapt to the needs of (post/trans) humanity in the 21st century. The second part will address what a progressive ‘right fit’ for the 21st century could look like, using the specific example of morphological freedom. I will first argue that a right to modify (or not to modify) one’s body is vital in technologically advanced societies. Second, I will examine how abuse to disabled people’s morphological freedom has emerged in recent policy proposals. Finally, I will outline what a right to morphological freedom might look like in practice. The essay will conclude that in order to live in a society that is truly progressive whilst the needs and rights of the most vulnerable are protected, a right to morphological freedom is imperative. Without such a right, human rights will struggle to perform as a sufficient system capable of addressing the changing nature of humanity in the contemporary age. How Can We Understand ‘Human Rights’? In the UK, the conception of a right as a matter of entitlement is perhaps most widely recognised in the form of the United Nations Declaration on Human Rights (UDHR), formally adopted by the United Nations General Assembly in 1948. Interestingly, the drafting of the UDHR was not especially motivated by the spirit of Enlightenment liberation, but ascended from the horrors of the Holocaust and the Second World War (Fagen 2009). Its original intent was to place ‘restrictions upon any state’s ability systematically to annihilate whole populations’ (Fagen 2009, 7), that is, to promote and protect certain conditions required to uphold a given quality of life for all. These historical roots grounded in fears of eugenics are perhaps why the UDHR is unique as a system of rights to declare equality of all human beings. In principle, by the mere virtue of being born human, every single person on the earth is equal, deserving of dignity and protected by this system of rights that is implemented through international law and policy (Fagen 2009). Of course, the idea of an inherent form of rights is not merely a modern phenomenon. For example, natural law—the idea of a human nature that is not conditional upon existing laws or society—is oriented in Aristotelian thought. Like the modern conception of human rights, natural law implies respect for all people by virtue of being human and is predicated on the notion that there exists some sort of essential account of what it means to be human: a human nature. The medieval Christian Church held the position that a human nature exists within us all that dictates desires and thus creates common moral standards suitable to govern human affairs (Brown, 2015). Natural law reflects the laws laid down by God, who bestows rights and duties upon humanity that reflect the natural order of his creation. It implies that within God’s vision, we all have an appropriate place and natural law tells us what that is. What it does not do is assume any form of equality and this is where it differs from the UDHR. Human rights are perhaps more aligned in this regard to natural rights, that we are all created in God’s image and therefore deserving of dignity (Jones 1994). It is these ideas of a human nature fully independent of society that modern human rights are predicated on (Fagen 2009). 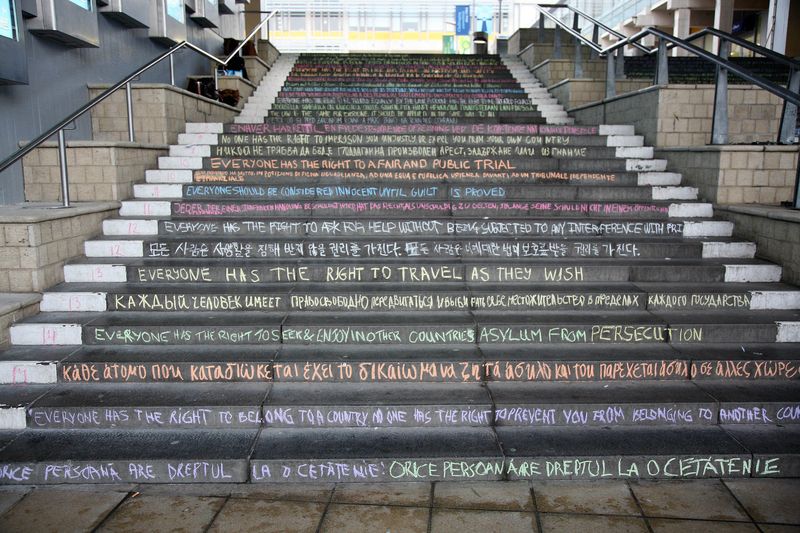 The UDHR may state many rights we are granted by virtue of being human, yet the United Nations (UN), who is the global regulator of human rights, is limited in its ability to enforce these rights due to the principle of national sovereignty. Besides the right to life, freedom from genocide and freedom from torture, ‘individual nation states are under no legal obligation to recognise or implement any other human rights principles’ (Fagen 2009, 34). At this point, it is interesting to consider the underlying principles of morality that exist within the notion of human rights. The legal positivist approach disputes the relevance of morality underpinning legal processes and argues that human rights (or laws more generally) derive their legitimacy from being legally recognised and codified. Such an approach is grounded in Bentham’s theory of law, wherein law is only legitimate when derived from an authoritative sovereign. However, the above issues of enforceability undermine such a perspective. Despite the UDHR being legally recognised and codified by the UN, this does not reflect any level of effectiveness. Arguably, our human rights are less about a legally codified UN declaration, but instead act as a moral imperative (reflective of its post-war status) encouraging recognition of a universal notion of human nature deeming us all equal. Having outlined what human rights looks like today, we can now begin to consider what a system of rights fit for the 21st century could look like. The term ‘morphological freedom’ was originally coined by philosopher Max More in 1993 as: ‘the ability to alter bodily form at will through technologies such as surgery, genetic engineering, nanotechnology, uploading’ (More, 1993: online). It is closely tied to the transhumanist principle of self-ownership. In order to maximise one’s personal autonomy, self-ownership asserts ownership over all aspects of the self: over one’s body, values, intellect and emotions. This principle contrasts with the religious notion of ‘original sin’, wherein believers are encouraged to hand ownership of their body and mind to a religious authority. Often such ideologies co-exist with the belief of mind-body dualism. This belief stresses the separation of the body and soul, the physical and the spiritual. Yet to assert self-ownership, the mind and body must be considered as a whole: ‘I cannot fully own my mind unless I own my body. I cannot own my body if I give up my mind’ (More 1997). Morphological freedom therefore proposes an inherent right of ownership over one’s self and the right to modify, or resist modification at one’s discretion (Sandberg, 2013). Oxford bioethicist Anders Sandberg (2013) claims that morphological freedom should be an essential right for future democratic societies. He proposes a rights ethics framework that is derived from our existing human rights: The UDHR states that all human beings have an inalienable right to life. This is the central right that all other rights stem from. The right to life should be synonymous with the right to pursue happiness; for what is the point of humanity without the prospect of flourishing and the potential to seek happiness? A freedom to practice the pursuit of happiness is then required. But, can we truly have freedom without the right to one’s body and self-ownership? More (1997) and Sandberg (2013) argue that we cannot. The right to self-ownership then implies a right to modification and thus a right to morphological freedom is granted. Technological developments create increased choice, complexity and a demand for usage and accessibility to these technologies. This results in even further technological development and increased pressure for the right to self-ownership in order for individuals to reap the benefits of such technologies (More 1997). The right to morphological freedom is hereby critical in order to grant people fair access to technologies that allow them to sufficiently self-express themselves and reach their full potential. However, morphological freedom is also vital to protect people from coercive biomedicine and further undesired modifications performed against an individual’s will. This is increasingly important when considering the progressively blurred boundaries between what constitutes therapy and enhancement (Sandberg 2013). Without the right to morphological freedom, coercive government policy has the potential to emerge. This is especially true in the current economic climate where there are a rising number of preventative treatments and technologies able to restore ‘disabilities’; disability is increasingly viewed as an expensive ‘lifestyle’; and the UK National Health Service is under growing pressure to save money wherever possible (Sandberg, 2013). Of course, the above factors do not guarantee the creation of coercive policy that forces the disabled to undergo restorative treatments. However, it does create a space that allows those refusing treatment to be labelled as irresponsible, and policy can then be made that directly abuses their right to morphological freedom and attacks their human dignity. I argue that such policy proposals have been made recently. For example, the UK government has threatened to withhold welfare benefits from the obese, alcoholics and drug addicts who refuse to accept treatment (Mason 2015). Such a policy coerces those unable to work into accepting treatment at the expense of losing their income. The ethical implications of this policy were quickly questioned by numerous charities, but without a right to resist modification, those at the expense of such a policy potentially have no legal protection. Interestingly, such discriminatory attitudes exist also within the transhumanist community. Leader of the US Transhumanist Party, Zoltan Istvan recently wrote an article in response to the need for millions of dollars to be spent on repairing sidewalks that are challenging to those with mobility problems. He argued: ‘Should society instead try to use that money to eliminate physical disability altogether’ and proposed a law that ‘insists on eliminating disability’ through technology such exoskeleton suits allowing people ‘the means to jump right back into the work force’ (Istvan 2015). The discriminatory attitudes of these policies is striking and the lack of legal protection for those at negatively impacted by such policies is concerning. However, a right to morphological freedom could undermine the impact of these policies as it would allow individuals to assert which treatments they do or do not wish to undergo (Sandberg 2013). Let us examine what morphological freedom could look like as a human right and what level of effectiveness it could hypothetically achieve. There are two types of rights: negative rights and positive rights (Fagen 2009). A negative right asserts that another person may not interfere with your right, whilst a positive right obliges actions by others to meet the needs of your right. In practice, the right to morphological freedom would comprise of both a negative and positive right. For example, when considering genetic modification (genomic freedom), a negative right may assert itself as: “You may not support my choice to genetically alter myself, but you cannot prevent me”. Whilst a positive right may be: “The state should provide affordable and accessible genetic engineering technology to fulfil my right to morphological freedom”. At this point one might wonder whether a right to morphological freedom is more a social privilege than a human right. Even if morphological freedom could gain recognition as a universal right that is independent of society and granted to all by virtue of being human, how would it look in practice? It is difficult to think of enforcing the right to morphological freedom on a global scale. Partially because even within the technologically advanced West there is a great deal of moral and ethical resistance against some emerging technologies that morphological freedom would permit (Consider the Catholic Church’s response to ‘three-parent embryos’ (BBC 2015).). Some may also argue that in many parts of the world the existing levels of human rights abuse are atrocious, and a right to morphological freedom in such societies is currently incomprehensible. Both of these points are certainly true; however it is important to consider the morality that underpins human rights. No matter how difficult it is to enforce the UDHR, its moral standing acts as an ethical benchmark for societies to strive toward. Thus, US ethicist Allen Buchanan (2015) argues for the moral significance of human rights and their potential to create moral progress in society. On these grounds, even if the right to morphological freedom cannot be legally enforced, enlisting it as a human right could lead to significant changes in how societies come to think of notions of self-ownership. The very nature of human rights as a universal concept does indeed make them very difficult to enforce, and potential resistance from particular groups in society may make morphological freedom even harder to legally implement. However, such changes are imperative to enable a truly progressive society that protects the right of self-ownership for the most vulnerable. Without adapting to the needs of an increasingly technologically advanced world, human rights will not sufficiently protect the inalienable dignity and equality of humanity. BBC. “Churches Oppose Three-Person Baby Plan.” BBC News. 30 January 2015. http://www.bbc.co.uk/news/uk-31063500. Brown, Chris. “Human Rights and Human Nature.” In Human Rights: The Hard Questions, edited by Cindy Holder and David Reidy, 23-38. Cambridge: Cambridge University Press, 2015. Buchanan, Allen. ‘”Moral Progress and Human Rights.” In Human Rights: The Hard Questions, edited by Cindy Holder and David Reidy, 399-417. Cambridge, UK: Cambridge University Press, 2015. Fagen, Adam. Human Rights: Confronting Myths and Misunderstandings. Cheltenham: Edward Elgar Publishing, 2009. Istvan, Zoltan. “In the Transhumanist Age, We Should be Repairing Disabilities, Not Sidewalks.” Motherboard (2015): http://motherboard.vice.com/read/in-the-transhumanist-age-we-should-be-repairing-disabilities-not-sidewalks. Jones, Peter. Rights. Basingstoke: Macmillan Press, 1994. Mason, Rowena. 2015 “David Cameron Calls on Obese to Accept Help or Risk Losing Benefits.” The Guardian, 14 February. http://www.theguardian.com/politics/2015/feb/14/david-cameron-obese-addicts-accept-help-risk-losing-benefits. More, Max. “Self-Ownership: A Core Transhuman Virtue.” 1997. http://www.maxmore.com/selfown.htm. More, Max. “Technological Self-Transformation: Expanding Personal Extropy.” 1993. http://www.maxmore.com/selftrns.htm. Sandberg, Anders. “Morphological Freedom—Why We Not Just Want It, But Need It.” In The Transhumanist Reader: Classical and Contemporary Essays on the Science, Technology and Philosophy of the Human Future, edited by Max More and Natasha Vita-More, 56-64. Chichester: John Wiley & Sons, 2013. Walker, Neil. “Universalism and Particularism in Human Rights.” In Human Rights: The Hard Questions, edited by Cindy Holder and David Reidy, 399-417. Cambridge, UK: Cambridge University Press, 2015. Jessica Tatchell wrote this essay in response to a question posed in Steve Fuller’s “Social Theory of Law” undergraduate class in Spring 2015: ‘What do you take to be the strongest argument against the idea of human rights?’ Tatchell was awarded Warwick Sociology Department’s 2015 prize for best academic performance by a second year student.